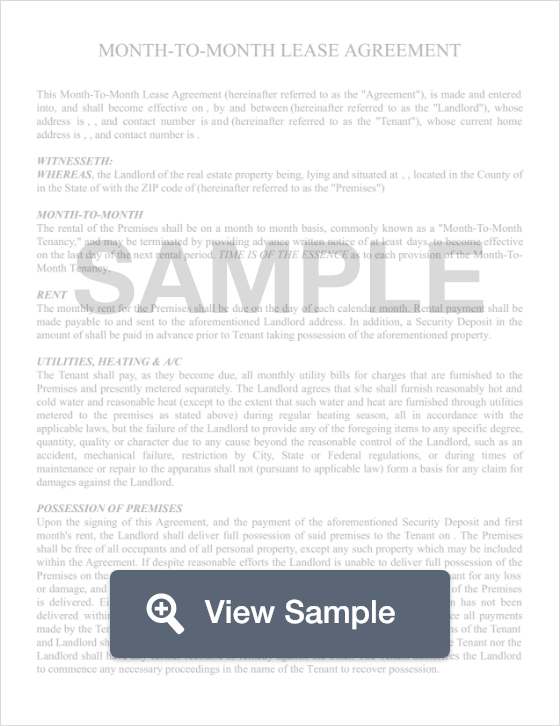 What is a Colorado Month to Month Lease Agreement? Colorado Month to Month Lease Agreement: What Is It? A lease agreement in the state of Colorado is an agreement that allows the tenant to reside in a property for a short period of time (one month) rather than the typical one-year agreement. This type of agreement is great for individuals who work short term, or contracted positions and need to move often. This is a type of agreement is also great for landlords because it allows the landlord to have greater flexibility if his or her tenants turn out to be troublesome because the landlord does not have to deal with them for a whole year. These types of agreements work just like long term agreements, providing specific information on rent payments, due dates, and property rules. According to residence laws in Colorado, tenants must give a specific notice depending on how long they’ve lived in the rental. If a tenant has lived in a residence for longer than one month but less than six months, they are to give at least a 10-day notice. If the tenant has lived in a residence longer than six months but less than one year, they must provide a 30 days notice. If a tenant has lived in a residence for longer than a period of one year, then they must provide at least a three (3) month notice.